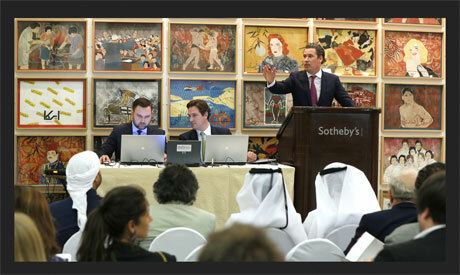 Sotheby's Contemporary Art Doha auction achieved a total of $15,199,750,00 on Monday, establishing the highest price for an auction of Contemporary Art in the Arab region. According to Sotheby's official press release, "The sale was 89.1 percent sold by lot. Records were set for nine artists, including a record for a living Arab artist [Chant Avedissian]." Egyptian contemporary artist Chant Avedissian, born in Cairo in 1951 to Armenian refugees, reached double the record with his 'Icons of the Nile,' made up of 120 parts, using gouache, hand-coloured stencil, gold and silver acrylic paint on cardboard. The lot sold for $1,565,000 - (against estimated $1 million) not only setting the record for the artist at any auction, but also placing him as the highest selling Arab living artist.